The Women's Peakfreak Low Outdry, all clean out of the box. Whether you're on a hike over steep, muddy trails or bounding through streams in and puddles through the woods, you want a shoe that can handle any type of terrain. 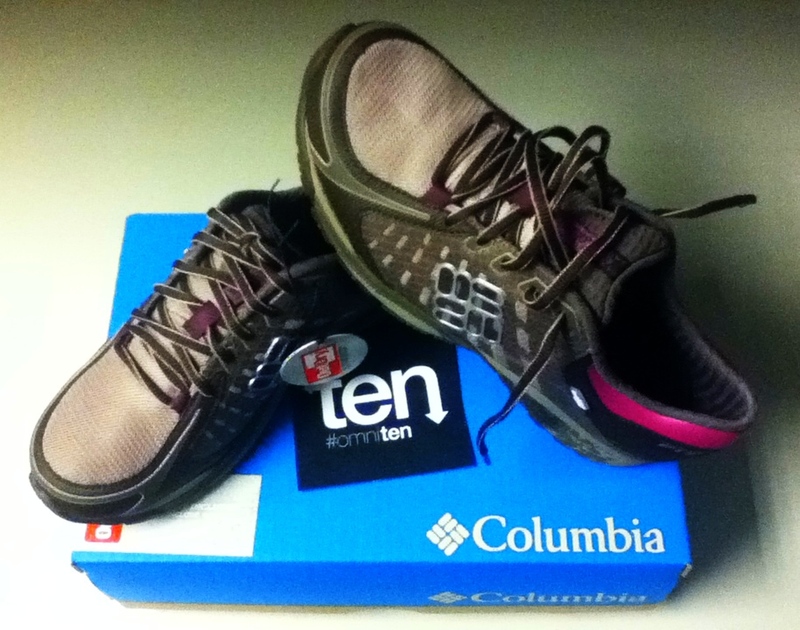 As a member of Columbia's #OmniTen team, I've been testing a variety of new and innovative products, and among them could be my next go-to trail shoe, the Women's Peakfreak™ Low Outdry®. Super stable, not too bulky, comfortable and legitimately waterproof, so far, they've proven themselves able to handle everything I've thrown at them. The PeakFreak shoes are designed for all different types of adverse terrain you could encounter during hikes, trail runs, scrambles, even light climbing. They're designed to combine running shoe style and design with technical trail performance and waterpoorf, breathable technologies. Columbia's Techlite® Fit™ system combines a soft internal core with a supportive frame to ensure stability and midfoot support while the mesh upper lets feet breathe. Techlite is also antimicrobial and odor-resistant, which is a big plus for any pair of shoes. The Omni-Grip® rubber outsole is designed to provide extra gripping power on all types of surfaces. Right out of the box, the PeakFreaks felt like a solid pair of shoes. They're not super heavy, weighing in at 11 ounces, but definitely felt like they'd stand up to anything. I put them on with light ankle socks and immediately noticed the toe box was a bit too wide for my forefoot. With my narrow feet, this wasn't surprising. I laced them a bit tighter and was able to get a pretty good fit. They're still a bit too wide for me, but not wide enough to cause significant issues. I was excited to find a good level of arch support, which is normally another problem I have with trail shoes out of the box. In the middle of the super scientific Bathtub Test. But, are they really as waterproof as Columbia says they are? I'm always skeptical manufacturer claims that shoes not made from one solid piece of material, like these, are waterproof. But as it turns out, Columbia's OutDry system actually does create a single membrane that works to seal out moisture from every possible point. To see if OutDry really works, before I even considered taking the PeakFreaks outside, I employed a super scientific testing method I've never tried with trail shoes before - the Bathtub Test. After filling my tub with three inches of water, I laced up the shoes and stepped in, standing still in the water for just over a minute. I splashed around a little and even stuck the shoes under the running faucet. The verdict? Out Dry is no joke. Nothing got in. The only part of my socks that were wet after The Bathtub Test were the spots around my ankles above the line of the shoe. Though I can't think of many instances in which I'd be in standing water for a long period of time outdoors, it's comforting to know that Out Dry really works. After The Bathtub Test, I took the PeakFreaks out for a spin during a special Earth Day event with TerraMar Adventures. I've been a guide and organizer for TerraMar since 2008 and love getting out for events designed to help us protect and conserve the areas we play in. We planted at least a dozen trees, pulled invasive garlic mustard and other plants, all in the pouring eastern Pennsylvania rain with the Wissahickon Restoration Volunteers. It was a great opportunity to take the shoes out to see what they could really do. Good and dirty after a day out in the mud! While tramping all over slippery, wet slopes, I was thankful for the Omni-Grip outsole and the forefoot rock guard; no matter how hard I try to avoid stubbing my toes, it always happens. The strategically placed traction lugs kept me stable in mud, dirt and on a hillside completely covered in brush and wet leaves. Plus, my feet stayed dry, and there's not much worse than dealing with soggy socks. Overall, I was impressed with how the Peakfreaks performed, particularly with respect to living up to everything Columbia promised, and can't wait to take them out on more hikes this spring. If this isn't enough to convince you to try them, Outside Magazine named them "Best for: Trails" in their May 2012 issue. Huge thanks to Columbia for providing the shoes for testing! Use the #OmniTen hash tag to follow along with the team on twitter, and keep checking back here for more adventures! Glad you liked the review, Haley! Let me know if you get the shoes, would love to hear how they work for you! water proof your investment with this great product. The Leader in manufacturing earth friendly waterproof products for you and your family; Waterproofing for tents, camping gear, outdoor gear, fabrics, boat covers, awnings and many other applications. Dry Guy lets your boots breathe while protecting against moisture, mould and stains!